While exercise can add a healthy glow to your skin, it can also be a potential trigger for breakouts and other skin irritations. Keep your skin clear by implementing these helpful habits. Keeping your skin clear starts before you even begin to exercise. Regular makeup blocks the pores and prevents most of the sweat from coming out, causing it to build up under the skin. In turn, bacteria grows causing your skin to break out. Instead, invest in non-comedogenic makeup like MakeSense® Original or Advanced Anti-Aging Foundation to keep your skin breathable and your pores clear. For those who prefer to remove their makeup before working out, you can use Fooops!® SenseCosmetics®Color Removing Wipes to quickly remove makeup without stripping moisture from your skin. Although spandex and other synthetic materials are common components of trendy workout clothes, opt for natural fibers if you’re prone to breakouts and skin irritations. Look for natural fabrics like hemp or cotton and be sure to take off your sweaty clothes as soon as you can after a workout to avoid accumulating dirt and sweat on your skin. Before putting clean clothes on, jump in the shower to wash away those impurities. While the gym is a great place to get fit and healthy, it can also be a breeding place for bacteria, which, as mentioned previously, can trigger post-workout breakouts. Even if the staff members at your gym regularly wipe down the equipment, it’s best to clean whichever piece of equipment you want to use before you start using it. Acne does not just affect the skin on your face; it also affects your body! Be sure to prevent acne from head to toe by showering after workouts. Use cleansers and body washes that help maintain your skin’s pH balance like SeneDerm 3 in 1 Cleansers and Moisturizing Body Wash. Follow with DayTime Moisturizer and Advanced Hydration Body Lotion to ensure skin is moisturized after your workout. Another helpful strategy to keep breakouts at bay is to exfoliate your entire body two to three times each week. Exfoliation will remove dead skin cells that can trap acne-triggering bacteria. Try using the SeneDerm® Smoothing Body Scrub, which contains volcanic ash as a natural exfoliator and soothing, moisturizing ingredients such as shea butter, coconut oil, and aloe leaf juice. However, be sure to avoid scrubbing too roughly to prevent irritation. Keeping gym clothes and towels freshly laundered is vital to maintaining clear skin. Sweat and dirt build up on workout clothes, so it’s best to put on a clean outfit each time you work out. This is especially important for sports bras and shorts, since two common acne zones are the back and buttocks. By implementing these strategies into your hygiene routine, you’re well on your way to minimizing acne outbreaks while reaping the benefits of physical exercise. 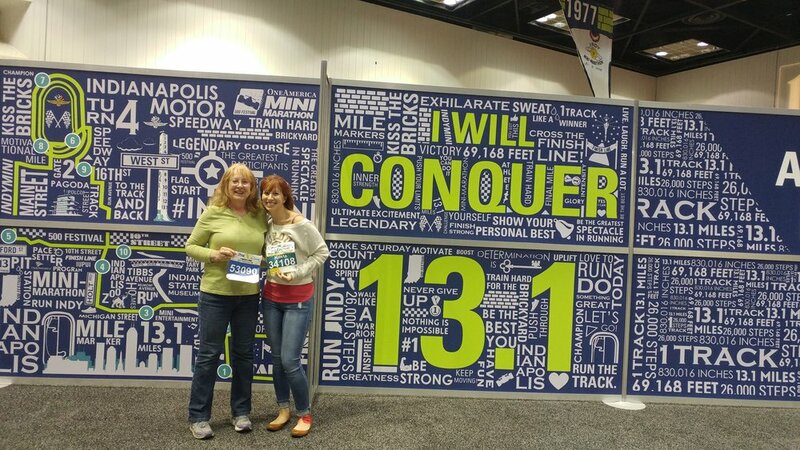 This past weekend I had the opportunity to run my 2nd Indy Mini Marathon in Indianapolis, IN. I had planned to run* with a friend of mine but she found out she had a family member's graduation to attend a few weeks prior so once again I flew solo. *By run, I mean I'd see her at the start and we'd reconnect at the finish. I'm slow. She's not. I should be clear here, I hate running. There are small little moments where it isn't horrible, in fact it can be downright fun. But the training part? Generally not a fan. During the run (assuming you're slow like me and start in the back), you get to see a HUGE variety of people. It's when you see these people that the emotions really kick into high gear. I saw people who were running their first half marathon, many of them not the young "kids" you might think who would be out for their first. I saw early on, a couple of guys who ran in full fireman gear - complete with masks & O2 tanks. Those guys are heros, and badasses. My dad was a fire fighter so seeing them out there hit hard. You look at yourself trying to run in as little weight as possible and there are these guys in 40+ lbs of gear and you tell yourself you can totally do this. The woman carrying an American flag (and others too), with pictures of a person who I assume was her husband pinned to her shirt. She was running for her hero. The funny signs held by spectators along the course - good to make you laugh or bring a smile to your face when it starts getting tough or just to make you pick up the pace a bit. Some people make it a party and dress up - a guy in a T-rex costume, a group of friends dressed as Little Bo Peep, sheep and a black sheep too (I saw them hanging outside a bar having their own kind of aid station). Every single person out there has a story of how they arrived. Some look like they've been running for decades, and even if they are barely above walking they are still out there. The kid who looked about 6, walking the half with his mom. The 20- and 30-somethings who run for fun (craziness!). The first timers and the seasoned vets. When you're on the course, your history doesn't matter. Your speed doesn't matter. Every step is another line of your story. It's a reflection of how far you've come, how far you have to go - or how far someone has propelled you. I didn't make it through the first mile of the half before tears came to my eyes. Not from the 40 deg temps or the slight drizzle. But because of something I can't even put into words. That overwhelming feeling of doing something big, reaching a goal, checking a box, making yourself (or someone else) proud. I can only speak to the middle/back of the pack, but everyone there is friends. Standing in line for the bathroom? It's like you've known each other for years. Pacing each other? Training partners since the beginning. Coming to the finish? The best support crew you'll ever find. I don't know the names of the people I've run with, but every single one of them has made a mark on my life. The guy who looked to be about 70, he reminded me that I had more yet to give. The Army guys carrying full packs? I'm not carrying that load, I can push on. The kids (way) younger than me? I can find some more energy. I can keep going. And when its all over? You all have the same medal. You all have the same t-shirt. While your times are different, you are all part of a bigger story. You were a runner. Mom & I at the 5K start! It's spring and that means it is time to work it! This week - rockin that booty! 21 Days Done! So how did I do? Halfway done! Just a quick progress check on my 21 Day Challenge!